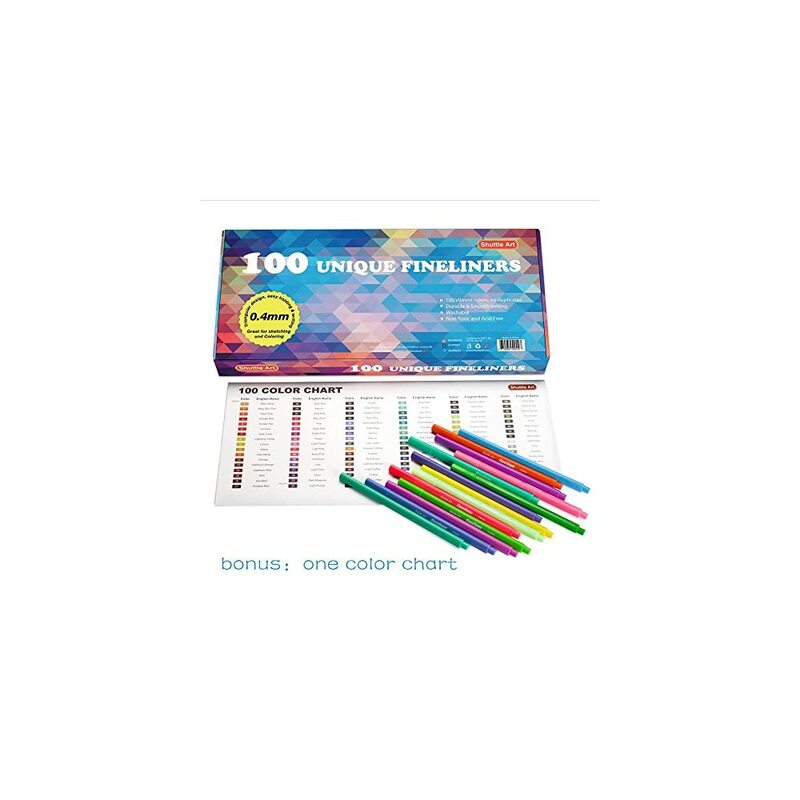 THE LARGEST FINELINER SET AVAILABLE: Shuttle Art Fineliner pack contains 100 unique, brilliant and gorgeous colors making it the largest set available on Amazon. 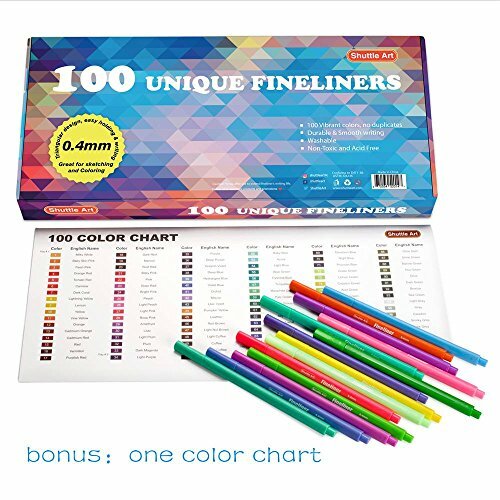 Fineliner Pen have a 0.4mm extra fine fiber tip and great for sketching, card making, scrap booking, journaling and coloring. 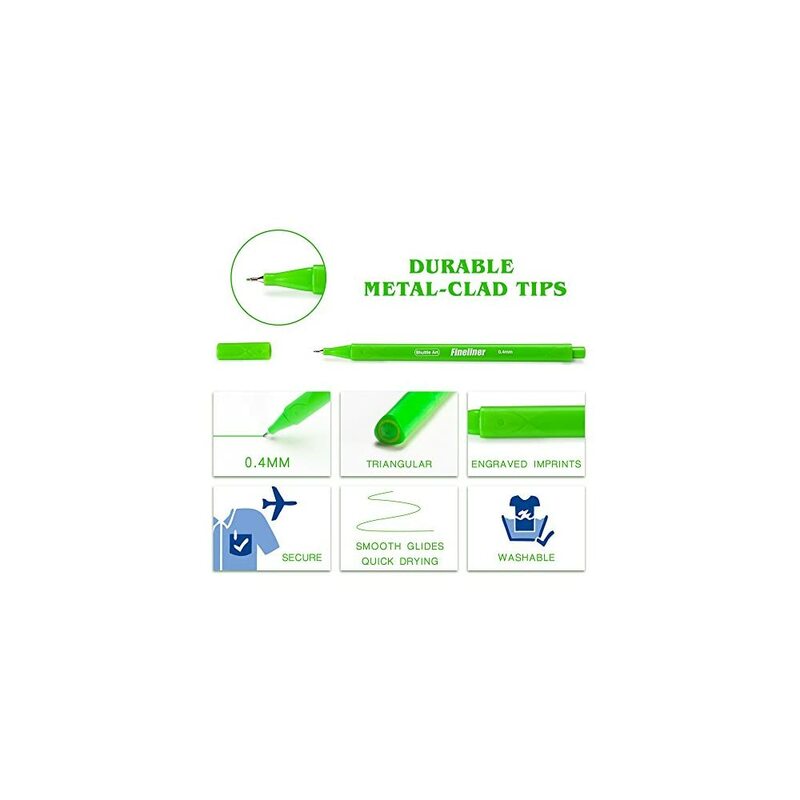 COMFORTABLE TO USE: Durable metal-clad tip and ergonomically triangular shaped barrel makes for a more comfortable grip. Artist quality ink is water-based, fast drying, odorless and blendable without bleeding. It’s safe as well, non-toxic. CONVENIENT PACKAGING: Fineliner Pens are organized in 3 individual black trays and stored in an exquisite cardboard box making them convenient to use and portable. Our Fineliner Pen Set is perfect for gift giving. Welcome to the coloring world with Shuttle Art 100 colors Fineliners. 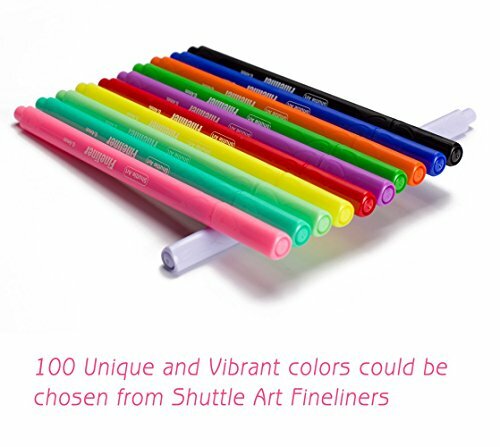 Shuttle Art Fineliner 100 Pen set (No Duplicates) contains 100 individual colors ranks and NO.1 on Amazon now. Each pen is filled with high quality artists ink that glides smoothly and dries quickly. Water-based ink is odorless and blendable. It’s also non-toxic and doesn’t bleed making them ideal for artist work or leisure use. Nice cardboard packaging makes it presentable as a gift. Children, friends and family members will be excited when they receive this amazing gift. Colors are vibrant and bold, which will definitely surprise you. 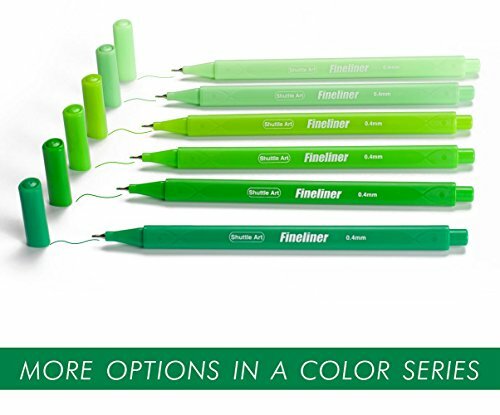 We put a great deal of effort in creating the most colorful set of Fineliners available today. Ink color matches the pen barrel. Pens are stored compact trays that keeps them tidy and makes “searching pen” much easier. We’ll even give you a free Color Chart to assist you in finding the perfect color. 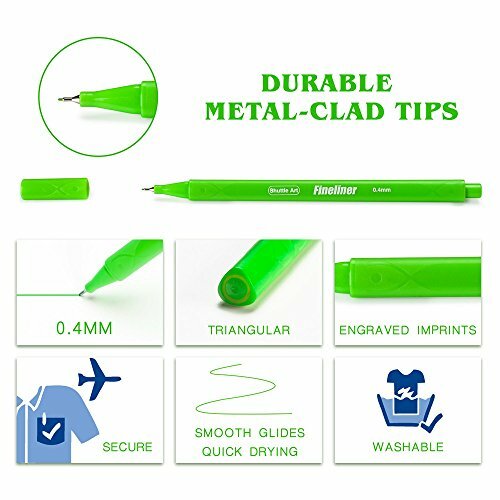 Each Fineliner has a superfine and metal-clad tip, ergonomic triangular shape for relaxed and easy writing. Children, teens and adults who are obsessed with coloring are provided with a new approach to keep them entertained and challenged. Coloring also provides a way to express your creative side on greeting cards, invitations, decorations , etc. Acid-free and non-toxic, conforms to safety certificates: U.S. ASTM D-4236 & EU EN71 . BONUS COLOR CHART: A DIY color chart is included that gives you a general idea of all the colors available and makes it easy to locate colors for your project. Notice: Color chart is for reference only, for exact color please check the pens. 100% SATISFACTION GUARANTEE:We promise to solve all your product’s problems. A full refund is available, don’t hesitate to buy. The fun I could have with these, I love using adult colouring books and the colours in these pens look very vibrant and the narrow nib would make precision easier. Hello, my name is Angela and I’m addicted to buying colored pens. I’m the Mom that gets excited about back to school shopping because the colored pens are Cheaper and I can get more. Needless to say, when I saw this set, I knew it had to be mine. When they finally arrived and I got my first look, I became Gollum and “My Precious” was all I could say!! When I finally used the pens, I heard The Angels singing hallelujah!! 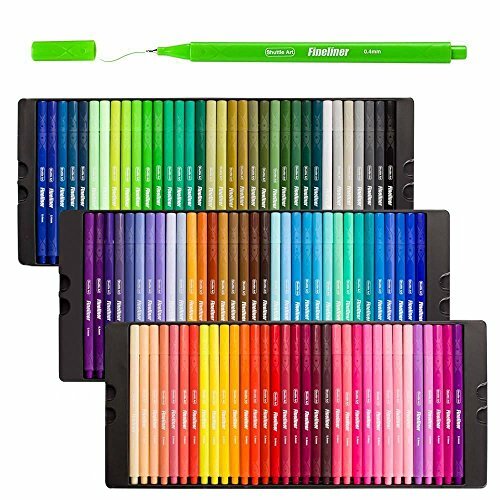 You don’t just have to use them for coloring, these pens are great for everyday writing. You can use them in your journal, write beautiful, vibrantly colored letters, and even make your own cards. With 100 different colors and the quality of these pens, the possibilities are endless. The packaging is great. It helps you keep your pens organized and protected and the box is decorative. If you are like me, and would rather have colored pens over jewelry, then say hello to the diamonds of the pen world! I will definitely be buying more of these, so you may want to hurry and get yours before I buy them all! it sounds like they dry too fast for stamping?